Posh chiefs Barry Fry (left), Bob Symns (centre) and Darragh MacAnthony have a reason to laugh after securing an FA Cup tie at Chelsea. Peterborough United will make at least £500k from their glamour third round FA Cup tie at Chelsea. The club’s director of football Barry Fry has already been in touch with Bradford City, who famously beat Chelsea at Stamford Bridge in the FA Cup in January, 2015, to see how much they raked in on that famous day. Posh goalkeeper Luke McGee saves a penalty in the FA Cup win over Notts County. Fry is pleased some of the financial pressure on chairman Darragh MacAnthony will be eased for a couple of months. “It’s common knowledge Darragh writes out a big cheque every month to keep us going,” Fry said. “So if anyone deserves a big day out at a Premier League club with the chance of making some serious money it’s our chairman. “He will be able to keep his hand out of his back pocket for a couple of months at least. “I contacted Bradford City and they told me they made £472k from ticket sales alone two years ago so we should be able to match that if not beat it. “Ideally we’d get a draw at Stamford Bridge and get the profit up to a round £1 million! “We had a great day at Chelsea when I was manager, but this should be better, Chelsea are a much better side now then all those years ago for a start, but what an opportunity for our players and what a great Christmas present for our fans. “But most of all I’m delighted for Darragh. “The club is excited about the news, but we won’t be getting ahead of ourselves. Fry doesn’t believe an unplanned for financial windfall will make any difference to the club’s January transfer window ambitions. Posh have already tied down goalkeeper Luke McGee on loan from Spurs for the rest of the season which was a primary target. A centre-back to cover for injury victim Jack Baldwin and a new striker are the other priorities. St Albans striker Junior Marias is thought to be on the way to the ABAX Stadium after training with the Posh first team in recent weeks and playing for the club’s reserve side. Posh manager Grant McCann has also revealed he wants to extend on-loan midfielder George Moncur’s stay at the club. Moncur’s current deal expires after the January 2 game at League One leaders Scunthorpe. 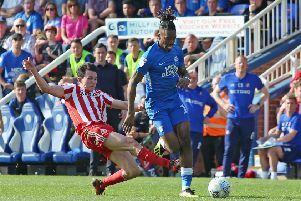 Barnsley are agreeable to the deal so it’s down to Moncur, who has not started a League One match for Posh since the 2-0 defeat at Fleetwood on October 15. McCann said: “The ball is in George’s court. He either stays with us or goes back to Barnsley where he might not get a game.